I’ve actually posted this before on my website but I recently redesigned everything over there and couldn’t find a place for it. So, here’s a blog from early summer 2008. 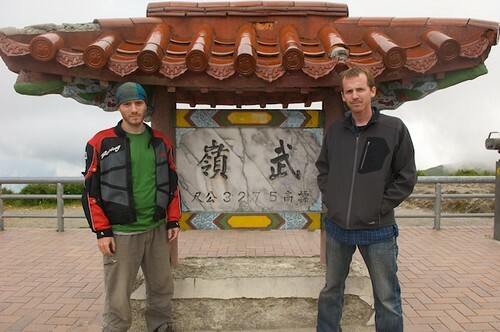 It’s a quick look at a fast paced motorcycle trip my friend Ross and I took around Taiwan. 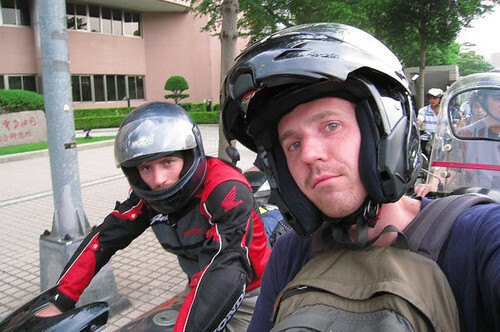 My friend Ross and I were lucky enough to have a few days off in the beginning of July and, as usual, we wanted to do some motorcycling. We both wanted to get back home in about four days but also wanted to do a lot of riding…since that’s what we like best. 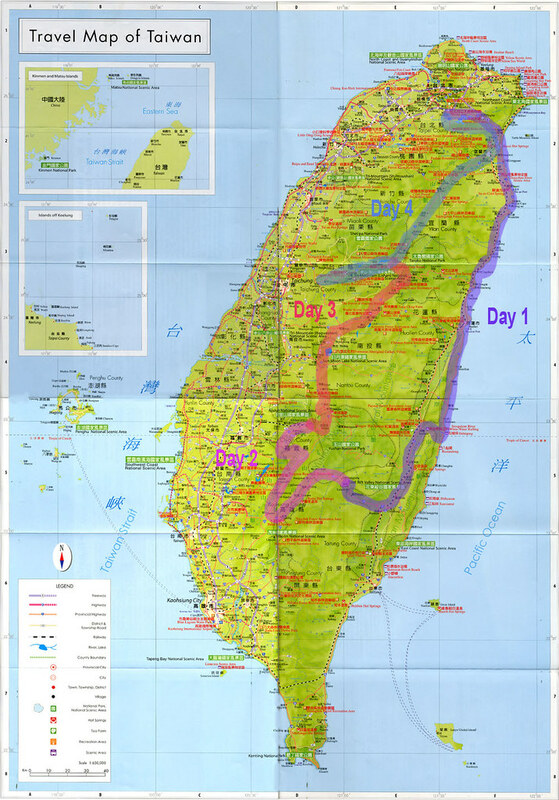 We ended up picking an ambitious route that took us over all three of Taiwan’s “Cross Island Highways”. We started out headed down the east coast along a highway known for it's beautiful cliffs and rocky coast line. 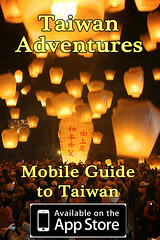 This spot is called Shr Ti Ping and has a campground directly behind the camera. Due to our ambitious driving schedule, we didn't stay here, we went farther south to the Southern Cross Island Highway and stayed in a hotel there. *SPECIAL NOTE: This is another picture that clearly shows the fungus problem I was having on this lens. Day two was the climb up the Southern Cross Island Highway. 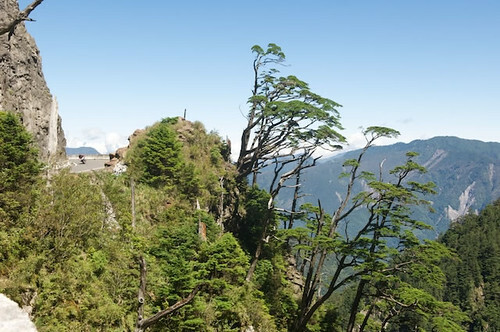 It's a stunning, remote highway that cuts across the southern Taiwan mountains through the southern edge of YuShan National Park. 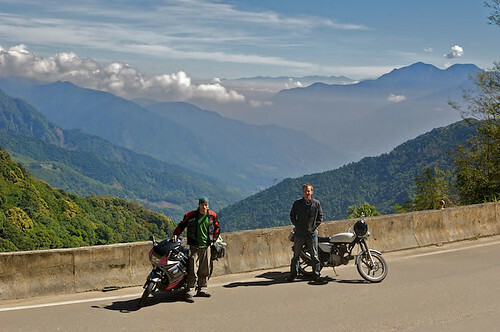 Of course it's a winding road that's just perfect for small bikes like ours. We both really like to ride and ride and ride. We averaged 8 hours a day driving on roads like this and covered 1,200km (750 miles) in four days. The Taiwanese love their suspension bridges. Taiwan usually experiences a couple of really bad typhoons every year that turn these peaceful rivers into walls of water that destroy everything in their paths...good reason to keep the bridge as high as possible. This is the end of day two. We're headed up Ali Shan Recreational Area after another brutal 8 hours of winding roads and intense heat in the valley. 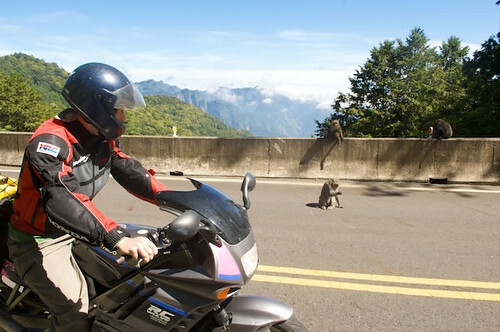 Starting off day three, we were welcomed by more crystal clear skys and a family of monkeys waiting on the side of the road for hand-outs. My favorite thing about motorcycling ...TURNS! 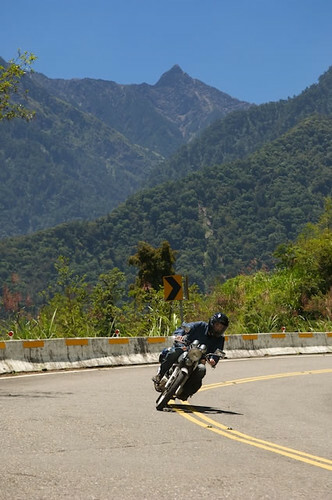 While I'm not hitting this one very well, the twisting, winding roads of Taiwan are a motorcyclist's dream. 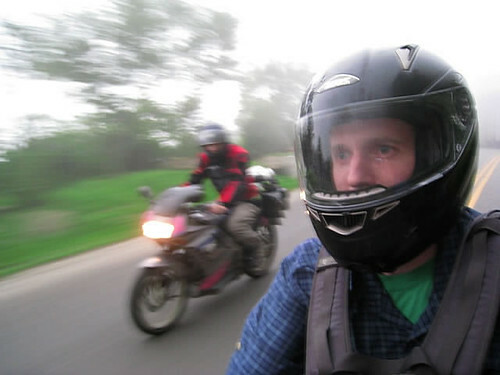 Ross and I made this trip on 150cc (two stroke) and 125cc (four stroke) motorcycles. There are a lot of big, super bikes out there but I really feel that these small bikes are better for the sharp turns and occasional traffic weaving that you need to do in Taiwan. That's YuShan (Jade Mountain) in the background, Taiwan's highest peak. We had originally planned to take it easy on day 3 but ended up driving for another 9 hours. 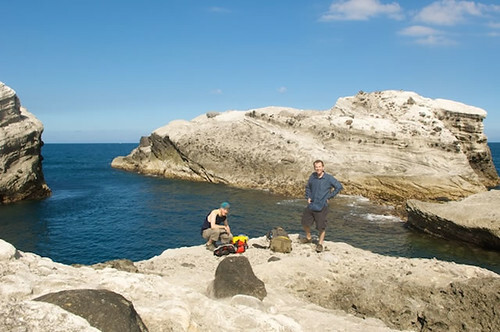 We always took some time to enjoy the beautiful sites. 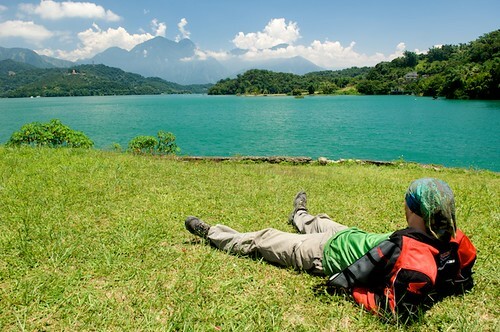 This one is Sun Moon Lake, in central Taiwan. Towards the end of day three we crossed the highest road in Taiwan. It goes up to 3275m (about 10,500ft). This is the only point in the mountains where I felt my bike wasn't big enough. The small motors have a lot of trouble getting enough air at this altitude. Day 4 was another perfect morning. 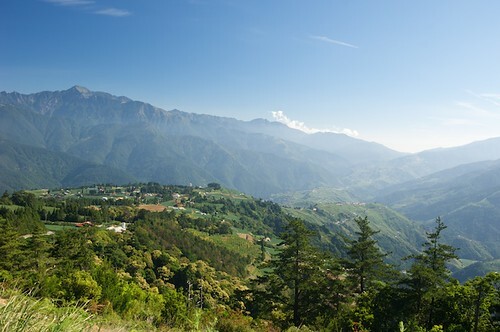 We camped on a high mountain above a small town called LiShan, on the Northern Cross Island Highway. Day 4 - Back in Taipei traffic. Sun burnt. Dirty. Tired. Happy. We're planning a week long trip at the end of the summer ...I'm not sure what we'll do for that one ...maybe go around twice? You could try joining M13 on a tour.